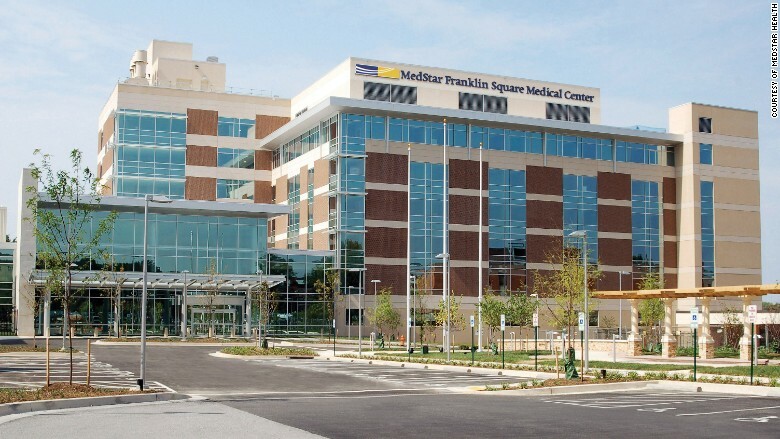 The MedStar Franklin Square Medical Center, one of several in a hospital chain for whom the FBI is helping investigate a computer outage. The FBI is looking into how a computer virus infected systems at MedStar Health, a large Maryland chain with 10 hospitals and dozens of clinics. "Early this morning, MedStar Health's IT system was affected by a virus that prevents certain users from logging into our system," the hospital chain announced on its Facebook page Monday. The virus spread quickly to computers at every MedStar hospital, according to company spokeswoman Ann Nickels. In an emergency maneuver to limit the infection, the company shut down its own computer systems. The yet-unidentified computer virus is forcing the hospital chain to rely on paper documents and some backup computer systems, the company said. But Nickels assured that hospital staff could handle the change in procedure. "Nobody's going to get delayed medical treatment," Nickels said. David Fitz, a spokesman for the FBI's office in Baltimore, told CNNMoney that "the FBI is aware of the incident and is looking into the nature and scope of the matter." Fitz said the FBI was made aware of the issue on Monday afternoon. MedStar has 250 outpatient sites in the Baltimore and Washington, D.C., regions. The hospital chain reported treating 4.5 million patients during its 2015 fiscal year. There's heightened attention to cyberattacks now. In recent months, several American hospitals have been tossed into chaos after having their computers infected by hackers. The weapon of choice has been ransomware, a particularly nasty type of computer virus that encrypts digital files. Hackers don't give you a key to unlock documents until they are paid a ransom. In mid-March, hackers attacked Methodist Hospital, an averaged-sized medical facility located in western Kentucky. They forced it to operate "in an internal state of emergency" for five days. Methodist Hospital refused to pay the ransom, instead shutting down the infected part of the computer system and relying on backup copies of the information stored elsewhere. In February, the Hollywood Presbyterian Medical Center paid a $17,000 ransom in bitcoins to get its computer systems back up and running. Several other American hospitals have also been hit by ransomware in recent weeks. Back at MedStar, Nickels said it's too early for her to say the hospital was hit with ransomware.